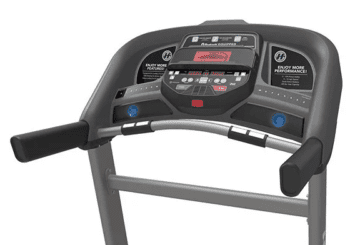 Horizon Treadmill T202 Review by Industry Experts! The Horizon Treadmill T202 is On Sale! Take Something Awesome and Make it EVEN BETTER! As the older sibling of the #1 best-selling Horizon T101, the T202 from Horizon offers some absolutely fantastic upgrades, including a larger incline and more powerful motor. Priced at $799, you are getting an exceptional deal on a tried-and-true design. 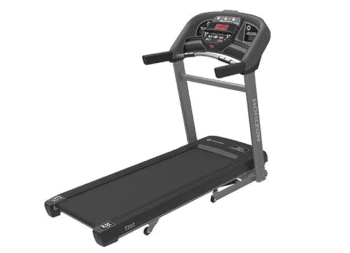 Designed for walking and jogging, the T202 is a great option for anyone looking for a mid-range treadmill featuring quality construction and an easy to use design. MID-WEEK SALE ENDS THURSDAY: The Horizon T-202 is ON SALE for $799 and they are throwing in FREE Shipping and a 100% Guarantee. 2.75 CHP Motor – This is a pretty substantial upgrade compared to the 2.25 CHP motor on the T101. As with all Horizon models, this is not an off-the shelf motor purchased by a third party. All Horizon motors are built specifically for their machines which make for less maintenance and perfect integration. Horizon motors are also designed for peak performance at lower RPMs which keeps the machine running smoothly and quietly at all times. This motor makes the T202 perfect for walkers and joggers, but may not be the best option for more avid runners. Those looking to put in more miles or follow a more strenuous running regimen may want to look at the Horizon Elite series, which provides more powerful motors to withstand serious mileage. Clean, Simple Design – Boasting a quick and easy 30 minute set-up, what the T202 lacks in bells and whistles it makes up for in ease of use. The hydraulic folding system makes prep for your workout and storage afterward a breeze. Plus, you can easily tuck the T202 away when it’s not in use so as not to take up precious floor space in your home. The straight-forward One-touch speed and incline buttons, along with Quick Program keys get you moving exactly how you want without any hassle. I can’t stress this enough. One-touch buttons are definitely WORTH IT! You will regret not having them if you buy a machine where you need to click the “plus” button over and over again to reach your desired pace. One-touch buttons add immensely to the running experience. Speed from 0.5 – 12 MPH – This is another area where we see an upgrade from the T101’s 10 mph top speed. This extra capability allows you to push yourself as you meet your fitness goals. 0-12% Incline – The T202 also offers an upgrade on the incline, compared to the 0-10% incline on the T101. Using the additional incline will help you target and tone additional muscle groups and challenge yourself when you are wanting a more intense workout. 325 lb User Weight Limit – While this model does boast a higher recommended user weight than the T101, it is important to note that the actual model weight is 187 lbs. This means that it isn’t going to provide the stability that you will find in heavier models. Bluetooth Connectivity – Designed with Bluetooth capability you can stream your favorite media from your device on the T202’s integrated speakers. This is a relatively new feature on Horizon machines and definitely one that we like a lot. 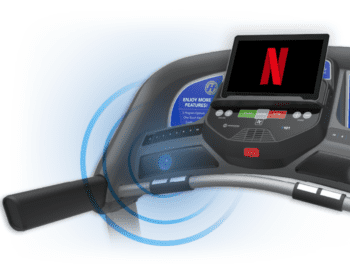 You can watch your favorite Netflix shows and have the sound come through your treadmill’s speakers. You can also download the free app to your phone or tablet and push your workout data to your favorite fitness apps. These features work in tandem with the convenient device holder and rapid-charge USB port so you’ll never lose your music halfway through your workout. Contact Grip Heart Rate Monitor – Keep track of your heart rate using the grip monitors on the T202. This does require keeping your hands on the grips in front of you, which can be a little more difficult if you are jogging. You can also purchase the wireless heart monitor that works with the free Horizon app using the T202’s Bluetooth. 3-Zone Variable Cushioning Response – The T202 offers Horizon’s 3-zone running surface to help make for more comfortable use. The front portion of the surface is more cushioned to provide increased shock absorption and relieve stress on your joints. The rear of the surface is a bit harder where your feet push off. Honestly, this is one of the more comfortable running decks that you’ll find from the brands out there. If you are in the market for a budget treadmill that also has some great features, the Horizon T202 may be just what you are looking for. Building on the success of the T101, Horizon has simply upped the ante with the T202, while only adding $200 to the price tag. If you are looking to use your treadmill for walking or jogging, the T202 has you covered with a 2.75 CHP motor. If you are an avid runner who likes to put in the miles, this may not be the treadmill for you. In that case, check out the Horizon Elite T5, Elite T7-02, or Elite T9-02. However, the trademark quality we’ve come to expect from Horizon treadmills means that you will get a smooth, quiet workout every single time you step on. In terms of the belt itself, you will need to be prepared to do regular maintenance, as it will need lubrication. The T202 does utilize a one-ply 1.4mm belt, which is not going to be as durable as the thicker belts seen on more expensive models. However, the 3-zone cushioning technology makes for a comfortable running surface that also helps to protect your joints. The T202 features a standard LED display, but you can take advantage of the Bluetooth capability and the free app to view your workout stats and sync them with your favorite fitness apps. Plus, the Bluetooth works with the speaker system so you can listen to your favorite playlist to keep you motivated. The 12% incline and 12mph max speed also give the T202 an edge, allowing you to push yourself and do a wider range of workouts than you can on many other budget treadmills. Overall, the Horizon T202 is a reliable, quality treadmill that offers some fantastic features not always seen in this price range. 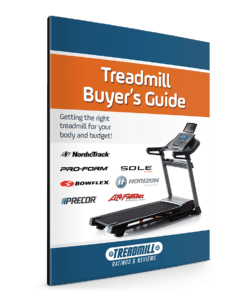 If your budget is limited, but you still want a treadmill that you can count on to help with your fitness goals, this is an option you won’t want to miss. 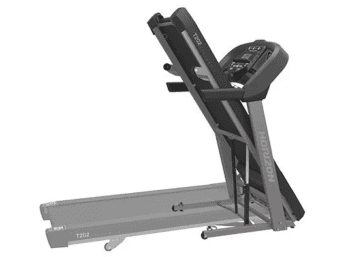 To learn more about the Horizon T202 treadmill, check out HorizonFitness.com.